Drove up to Lexington today to go to the Fasig-Tipton Winter Mixed Sale. Wasn’t there to look at buying anything new. 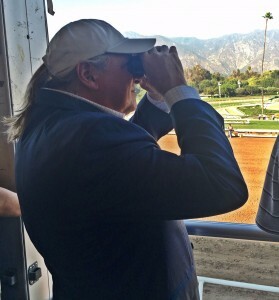 Wasn’t there to hunt for a new racing prospect or an investment opportunity. Wasn’t there to see any of my friends, although I did run into some for sure. And, enjoyed that. Wasn’t there for fun, really. After watching a few hips go through the sales ring, me and friend Ryan Dickey made our way over to Barn 4 on the Fasig-Tipton grounds. Went down to the consignment of Four Stars Sales Agency. It was drizzling rain, a bit. Clouds covered the sky. Dreary camouflaged my mood, too. Asked to see Hip 520. Just had to go and see our beautiful bay filly First Kiss. Had to go and give First Kiss my last kiss. Had to go and pay her one more visit and then kiss her goodbye. On Tuesday afternoon, First Kiss will be sold and will go to a new family. She will soon begin her next career as a mom. Hopefully, she will be going to a new farm and family that loves her just as much as we have over the past few years. Hopefully, she will finally have the luck and fortune that she always deserved and never truly got on the racetrack. Hopefully, she will fulfill her promise and potential. Both of which, she has plenty. Both of which, I always believed she would reach. Both of which could still make her a superstar. It was in the summer of 2016 that my friend and partner Mike Schnell and I bought First Kiss. She was part of a dispersal being conducted during the Fasig-Tipton July Sale. At the time, she was purchased by Mark Taylor of Taylor Made Farm, who thought she had potential, too. With the help of our young trainer, Stephen Lyster, we were able to buy First Kiss privately off Mark and the farm and she soon joined our growing list of runners at the Lyster barn. I remember going to the stable the first day she arrived. After all, the filly has a beautiful pedigree. She is by Smart Strike, one of the world’s most successful stallions and sire of sires. She is out of a Graded Stakes winning Giant’s Causeway mare, Bridge Game. And, she is from the same female family that has produced the wonderful and highly successful runner / stallion Tiznow. And, to top it off, she is a beauty in her own right. Pretty head. Wonderful eye. And, a joy to be around. The look of a runner. The heart of a champion. And, the spirit of a winner. We all thought that First Kiss could and would be special. In her very first race, about a year ago, she ran super at Tampa Bay Downs over the dirt and going short. She finished second. She finished full of run. She finished full or promise. We were all thrilled. After all, we thought she could only be better on grass and going longer than 6 furlongs. She turned out to be “the one” with no luck. As they used to sing on the old country, TV show “Hee Haw,” if not for bad luck, she would have no luck at all. No fault of her own. Just for some strange reason, she found a way to get hurt. Stepped on a foreign object on the turf at Churchill Downs. Wrenched an ankle while going into the turn. Caught a speed monster at Belterra going just 5 furlongs. Finally, this past December, First Kiss appeared to put her bad luck behind her — along with all of the other horses she ran against. Finally, she put it all together. In a race at Turfway Park on Dec. 26, she ran like we always thought she could and would. Settled off a wicked fast pace. Rallied in the final turn. And, zoomed through the lane to easily speed past her competitors. Her rider, John McKee, said she was wonderful. Perfect. Warmed up good. Ran better. Galloped out great. Until she turned to head to the winner’s circle for the first time. Then he felt it. A bobble. As it turned out, First Kiss fractured a sessamoid. It was her last race. On Tuesday, she will make her last race for us. She will be lead from Barn 4 to the sale’s ring at Fasig-Tipon. First Kiss will kiss us goodbye. I will always root for her. And, I hope she finds her championship in motherhood.